Bernardo began his studies at the age of five years old with professor Inês Saraiva, at Orquestra Metropolitana de Lisboa. In 2013, moved to Madrid in order to do his bachelor degree with professor Sergey Teslya at Centro Superior Katarina Gurska, which he concluded with the maximum grade. Inside Portugal, Bernardo has played at venues such as Centro Cultural de Belém, Fundação Calouste Gulbenkian, Teatro Municipal São Luiz, Teatro Nacional São Carlos or Casa da Música. He has also played in countries such as Spain (Teatros del Canal, Auditorio Nacional de Música, Teatro Calderón de Valladolid), United States of America, Norway, Italy and Scotland. He attended Masterclasses in Lisbon, Madrid, Thun, Davos and St. Vallerin and played for professors such as Boris Garlitsky, Gilles Apap, Gwendolyn Masin, Daniel Garlitsky or Gerardo Ribeiro. Playing in orchestras, Bernardo has worked with directors as Michael Zilm, Nir Kabaretti, César Viana, Joana Carneiro and Vicente Alberola. He also played as a soloist in Lisbon with Orquestra Metropolitana de Lisboa and Concerto Moderno, and in Madrid with Orquesta de Cámara del Centro Superior Katarina Gurska. He is the concertmaster of Concerto Moderno, a string chamber orchestra created and directed by Inês Saraiva and César Viana. Alongside this ensemble he played with soloists such as Iddo Bar-Shai, Pavel Gomziakov, Natalia Tchich, Daniel Garlitsky and many others. 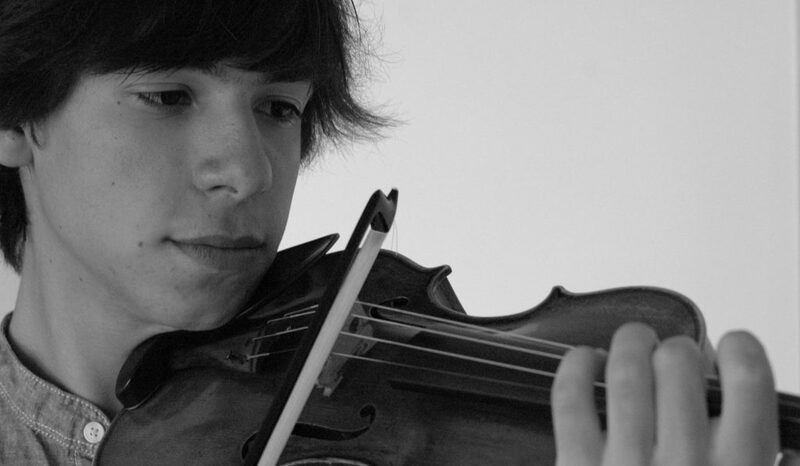 As the violinist of Trío Ayren, Bernardo is the winner of Concurso Permanente de Juventudes Musicales de España, 2015 – chamber music speciality. Since then, the trio has played all around Spain and in Lisbon (Portugal) as well. In March 2018 they will play Beethoven’s Triple Concerto (Op.56) with Joven Orquesta Mediterránea. If you are interested in working with Bernardo, please get in touch with the EMCY Office. W. A. Mozart, Sonata k.481 (Eb major). J. Sibelius, Concerto in D minor op.47.